The Pomeranian is as “toy” or “teddy” as you can find. They are cute and cuddly because of their fluffy coat. They are known for their perky and attentive nature, and their “ferocious” bark belies their small size, meaning they make excellent alarm dogs and companions for the elderly. The most royal of breeds, the “Pom” derives from the German Spitz. They are miniature in stature, intelligent, love training and are gorgeous to look at. They also make for an excellent lap dog as they mature. Pomeranian breeds may also be known as Poms, or Pom Poms. Teddy bear pomeranian dogs are a newer type of dog which have been around since the 1700s when Queen Victoria owned quite a small pomeranian. Of course the public then wanted to emulate her nobility. They are a breed of dog of the Spitz or Nordic type. They were bred originally in Germany and were favorite dogs in the royal court. Perhaps as a result they tend to act like they truly are a member of the royal class. Lay out your finest silverware for these high society pooches. Pomeranians exist in a rainbow of colors alike other similar teddy bear dog breeds. You may spot them in brown, black, white, cream, orange, red, blue, spotted, brindle, brown and tan, black and tan, and any combination of these. The most popular colors tend to be black, orange, white and cream. A very recent color addition that is gaining in popularity is called “merle”. It is quite exquisite and has been developed by breeders such that the pom will have a spotted coat. However, be aware that little is known about the genetic disorders that a merle pomeranian will experience, due to it being only a new breed. Pomeranians, alike many other types of Teddy Bear Dog, are playful, curious, affectionate, friendly and lively. Be aware though, that they can be aggressive to other dogs (even those twice their size!) if they feel competition or if they simply need to prove themselves. They are also alert and are sensitive to changes in their environment. Pom’s like to bark which can become a habit unless it is prevented with training. They will bark if they hear outside noises. Pomeranians are intelligent which can result in them being a bit manipulative if they wish to get something from their owners. Without proper training they can become dominant and aggressive. They enjoy being the center of attention and are extroverted (remember their royal pedigree!). Pomeranians like toys and if the owner wants their dog to spend time alone, toys can be the perfect antidote. Pomeranians are small dogs that weigh from 4.2 to 7.7 lbs (1.9 to 3.5 kgs). Remember they are like teddies! Their height when standing is from 5 to 11 inches (12 to 28cm). They are very compact, small and cute, although their puffy coat may bely their smaller stature. Regardless, they have a very big personality. The average life of a Pomeranian is between 12 and 16 years. They will live even longer if they are well taken care of with a good diet and are given appropriate exercise. It is important to know that trauma is leading cause of death when it comes to baby Pomeranians. When it comes to adult Pomeranians the three leading causes of death are gastrointestinal diseases, trauma and infections. 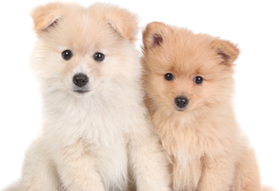 Pomeranians have abundant textured coat with highly plumed tail set flat and high. They are well known for their ruff of fur and feathery hair on the hindquarters. They are extremely loyal, intelligent, brave and amazingly cute. Animal Shelter or Animal Rescue?